I had no idea how many people volunteer, the range of roles and projects they undertake, the social responsibility many feel and the commitment they show. Working full-time in the health service I encountered relatively few volunteers, and learnt the extent of their contribution only recently. These volunteers provide an excellent service – assisting patients and visitors to find their way, escorting them to appointments, providing clerical support, running hospital shops, collecting patient feedback and editing patient information leaflets. Giving time to and sharing skills with the healthcare sector are great gifts. It has been estimated that three million people in England alone volunteer in health and social care, with the majority in the voluntary rather than the public sector. This led me to think about the scope for engaging more people in volunteering in the health service. 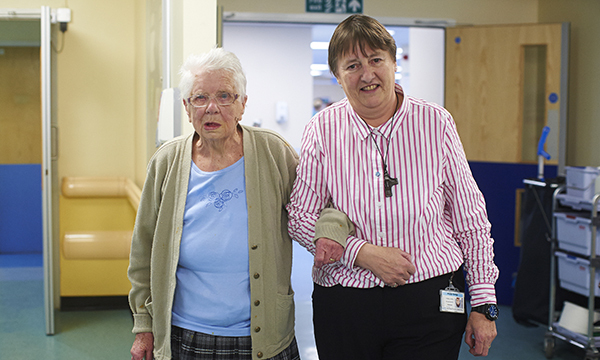 The help they give can ease the burden for staff and benefit patients. It is also apparent from the NHS Choices website that volunteering is good for volunteers, too. It improves quality of life, takes people’s minds off their problems, promotes a healthier lifestyle and even improves family relationships. Some large trusts have up to 1,000 volunteers. An important point is that they are not a substitute for staff, rather they complement them. Volunteers also need commitment from the organisation so they in turn are supported, trained and professionally managed. A report on volunteering by the King’s Fund suggests a strategic approach is needed and that volunteers can help improve patients’ experience of care, build stronger relationships between services and communities, support integrated care, improve public health and reduce health inequalities. These are all in tune with current health policy. Volunteers may already be engaged positively in your service, welcomed as part of the team, trained for their role and their skills used appropriately. However, as suggested in a report commissioned by HealthForce, which works with NHS trusts to improve volunteering practice, volunteering may be an untapped resource and worth exploring further.